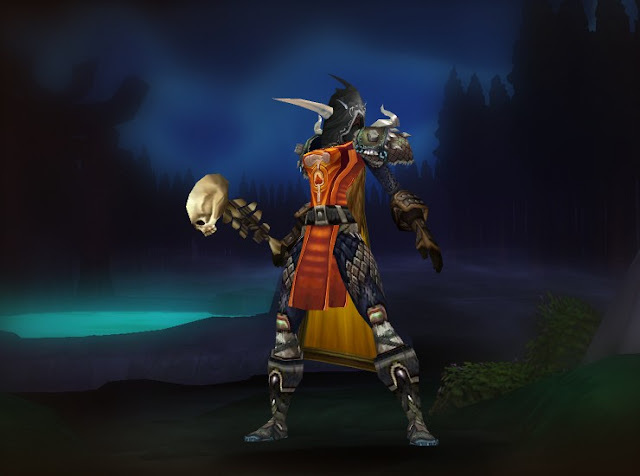 Warcraft Looks: Leather Mogging Outfit - "The Dark Ranger"
Warcraft Looks - Uncovering great armor and weapon looks for your World of Warcraft character. Leather Mogging Outfit - "The Dark Ranger"
This outfit has a somewhat mix-and-match look to it but all the pieces work together to give an over all feeling of badass-itude that I dig. Head past the jump for the full mog item list. About: Warcraft Looks is curated by Jim Younkin (of Power Word: Gold) and is a blog dedicated to discovering, uncovering and sharing the greatest looking armor, weapons and outfits in World of Warcraft. Submit Your Look! We're always accepting reader submissions. Send your favorite Warcraft looks, armor, weapons, screenshots, gear lists and guest posts to powerwordgold@yahoo.com. Plate Mogging Outfit - "Black Dahlia"
Cloth Transmog Outfit - "Green Diver Deluxe"
MogIt Addon - A must-have! Mixed Mogging Outfit - "The Golden Lioness"
Plate Mogging Outfit - "Lady In Red"
Mail Mogging Outfit: "The Steampunk Hunter"
Cloth Mogging Outfit - The "He-Man"
Power Word: Gold - Tips, ticks and strategies for making gold in World of Warcraft. Diablo 3 For Profit - News and Discussion about making real-world money in Diablo III. The Tram Rats Podcast - A Couple's Adventures In World of Warcraft. Butcherbot - Opinion and commentary about World of Warcraft.